Philip William May (1864-1903) was one of a large family born in Leeds to an engineer father and a mother with theatrical connections; his paternal grandfather had been, amongst other things, an amateur caricaturist. His career got off to a rocky start — at one point he slept rough on the London streets. Three years working on the Sydney Bulletin in Australia steadied him down, and he went on to spend some useful time honing his skills in Paris and Rome. He first came to prominence with The Parson and the Painter (1891), and after a stint on the Daily Graphic was taken on as a regular member of staff by Punch in 1895. He was illustrating Walter Besant's East London at the end of what had been his "golden years" — the mid-1890s. Technically, May was helped by the fact that illustrators were now able to see their work in "pure holograph in a way unknown to John Leech or Charles Keen" (Houfe), enabling him to produce energetic drawings which looked as if they were spontaneous, but had actually cost him a great deal in the preparation. This was ideal for his street sketches, especially "action shots" like "A Street Row in the East End," which prefaces the first chapter of Besant's book. 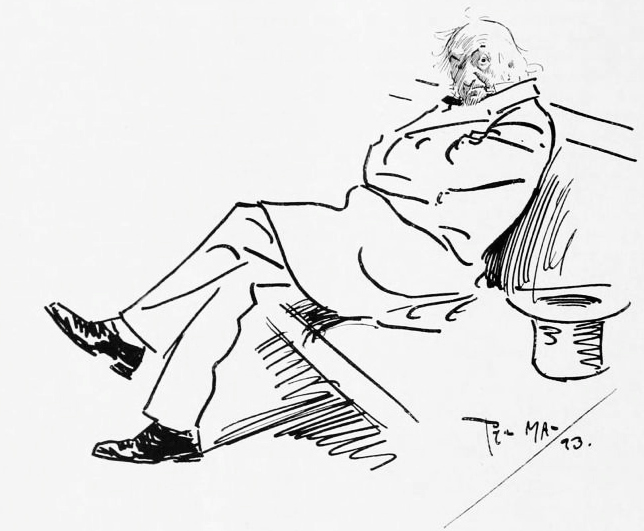 May's reputation was based on his drawings of the 'Arrys and 'Arriets that he saw on the streets of London, observed with tenderness and compassion. But he was a child of his time and some of his Punch contributions are of a racist or antisemitic strain which has grated on subsequent generations. This contrasts with the very generous nature to which all that knew him testified. As it happens, May has no illustrations in the chapter which Besant entitled "The Alien," although Leonard Raven-Hill has a cringing and cringe-making sketch here of "A 'Schnorrer' (Beggar) of the Ghetto." Perhaps May avoided the subject here. But he was of course depicting the lower classes. As an illustrator of types, that is to say, of generic features, he ran a special risk of being considered classist, racist etc. It is in the nature of such art to emphasize, if not actually caricature, the peculiar characteristics currently associated with groups of people. Yet his depiction of the trusting little under-age drinker "In an East-End Gin-Shop," taking her tipple from a rough but motherly-looking woman, suggests that he had a great store of humanity. This illustration probably goes with Besant's comment on the previous page, "What more natural than that the child should be invited to finish what her mother has left of the pint?" (123). Even May's "East London Loafers" outside a bar are "unfortunates," as Besant describes them (183), rather than scoundrels. Houfe, Simon. "May, Philip William (Phil) (1864-1903)." The Oxford Dictionary of National Biography. Online ed. Viewed 13 February 2008. Lambourne, Lionel. Victorian Paintings. London & New York: Phaidon, 1999.